Lee BIA Builders Care, the nonprofit charitable arm of the Lee Building Industry Association (BIA), has received a $12,000 donation from Aubuchon Team of Companies in support of its mission to provide emergency construction services at no cost to needy and deserving elderly and/or disabled homeowners, and their families, who cannot obtain repairs through traditional means. The impactful donation is a result of funds raised through Aubuchon Team of Companies’ annual “Helping Hands for the Holidays” event. 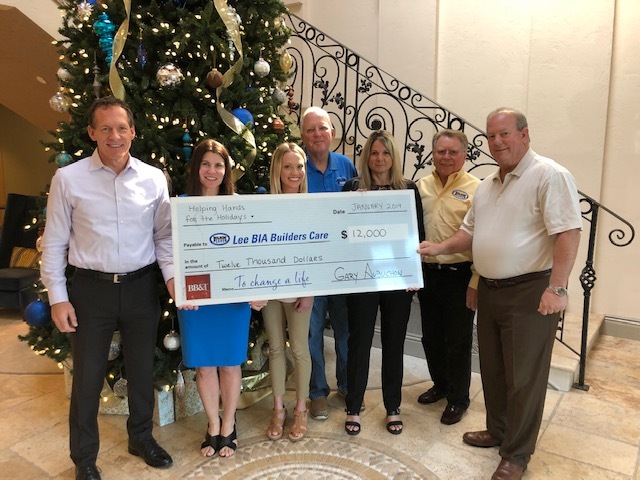 To date, Aubuchon Team of Companies has donated more than $116,000 to Lee BIA Builders Care through this annual fundraiser, fueling Lee BIA Builder Care’s efforts to make a difference within the lives of local homeowners and families.